I know some of you read this blog for healthy, all-natural recipes ~ and I think that’s wonderful, and I thank you for it! However, there are times when ~ it’s true, I confess ~ I bake food that’s NOT ridiculously healthy. I’m not ashamed! 🙂 It’s rare, and it’s almost 100% always for parties at which nobody cares to discuss health or wholesome living but instead to indulge in forbidden flavors. These marshmallow pops are a perfect example. Not an everyday treat, but there are also worse foods out there for you 😉 I’ve made them for the 4th of July, which is why they’re red, white, and blue. Since it’s still a couple days away, I’ve stored ’em in the freezer, and I have to say ~ they freeze well! Just be sure to thaw them before eating. I hope all of you in good ol’ America have a wonderful, fun, and safe 4th of July! I use a double-boiler method, but you can also use a microwave. Melt a small amount of the candy melts (either color) in the double boiler, or micro for 30 seconds. Stir well. Dip the end of each lollipop stick in the melted candy, then squish into a marshmallow. Repeat until all marshmallows have a stick. Place the marshmallows in the fridge for 10 minutes. Meanwhile, melt the rest of the open bag of candy melts. Fill a small plate with candy sprinkles. 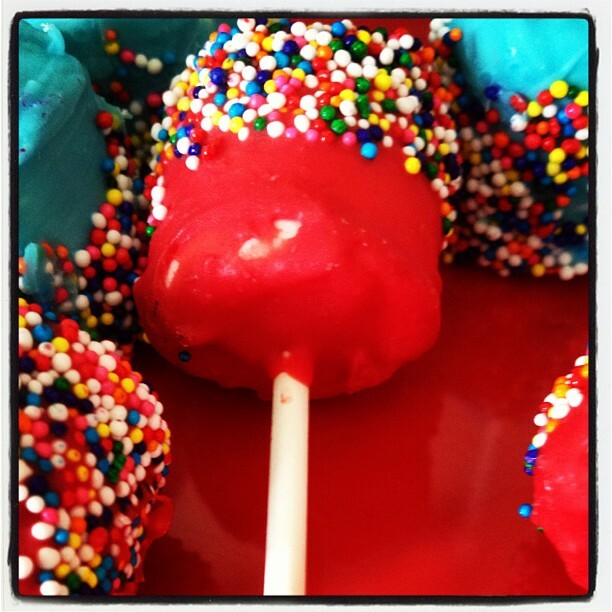 Dip and roll each marshmallow pop in the melted candy until coated. You might need to use a spatula, spoonula, or pastry brush. Set the candy-coated pops aside on a parchment-lined sheet until all are coated, allowing the melted candy coating to harden just slightly. Dip and roll the pops in the candy sprinkles. Place all the pops on a parchment-lined sheet and refrigerate for 30 minutes. Eat right away or keep chilled until ready to enjoy! Do you ever bake “naughty” treats? Do you have a favorite baking holiday? Yeah, I do. I think it’s really all about balance and being really extreme about healthy eating makes it really hard to stick to it as a lifestyle, Brave post girl! Happy 4th of July! Thanks, sweets 🙂 And Happy Canada Day to YOU, eh! Super festive andrea! My weakness would have to be gummy candies….like sour worms or those watermelon slices. I don’t keep them in the house though…saved for special occasions like the movies. Any plans for the fourth of july? Yes, sour worms! I eat gummy candies on long runs sometimes (10+mi types) for the immediate energy, but they’re good at the movies, too! 😉 I’ll be celebrating with friends on the 4th, enjoying a day off! Good gosh these are adorable! I love the size too…very pop-able!